General Olusegun Obasanjo and former president of Nigeria had two opportunities to help bail Nigeria out of the quagmire, but he burnt both chances on the altar of political expediency. The first time was when fate placed Nigeria on his hands in 1976 and h bee came the country's military head of state, following Murtala Muhammed's assassination. He ruled through to 1979, when he handed power back to the civilians. Of course, the former military officer who achieved surrender in the Nigeria's civil war pride himself for handing over power back to the civilians. And that had since became part of his credentials. Every Nigerian knew that the 1979 presidential election was not freest Nigeria had. Else, no one will be referring to the 1993 as the freest Nigeria had. The 1979 election was not only a sham, many Nigerians believed that the election was deliberately rigged for the winner. Why General Obasanjo allowed that under his watch despite his pretense to scholarship, intellectualism and discipline was beyond explanation. The 1979 experience became for Nigeria the foundation of the journey to abyss, a direction Muhammed came to power to correct. Knowing fully well the wrong foot the country had taken from independence, it was hard to understand how Obasanjo allowed the hawks to manipulate him and dumped the election winner on the country. The election result translated to four years of backwardness. The manipulation of the 1983 election in which the incumbent president, Alhaji Shehu Shagari who had benefited from Obasanjo's transfer of power was reelected exposed the untidiness of men who found themselves on the wheel of the nation's political vehicle. It could possibly be that the former military general inwardly realized the mistake he had put his country by allowing an unqualified candidate to emerge president against a well heeled and qualified candidate in the person of Obafemi Awolowo. 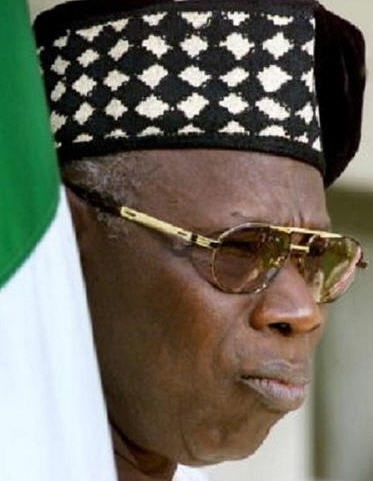 Obasanjo may have had a sigh of relief, when his military compatriots overthrew Alhaji Shagari in 1983 as a way to end a journey that would have been distrarous for Nigeria, and in which his name would be written as having been part of the cause. But successive military leaders including Muhammed Buhari and Ibrahim Babangida were not better than their predecessors. All that Nigerians witnessed were forceful changing of the baton without corresponding impact on Nigerians. Possibly God heard Obasanjo's criticism of his military fellows and answered his silent prayers, when General Sanni Abacha picked him up and put him in jail for his being vociferous against his own madness. Abacha died and thr consequent power vacuum and international community's demand for another transfer of power to civilians led to the incumbent military leader's search for a personality to win Nigerians' and the international community to their sincerity of purpose. They sought Obasanjo out, and he became a candidate, benefiting from a political quagmire that was part of his 1979 foundation for the country. He became the candidate to beat to earn the People Democratic Party's presidential ticket, having Babangida and other former military leaders drafting him to rule again. It was a second chance for Obasanjo to undo his past mistake. Although, information said that Obasanjo surrounded himself with intellectuals and that he exercised enormous power. But what was the product and end of his second chance? Obasanjo wanted a third term in office. What were the things he needed to do that he couldn't do in his two terms of a second chance that he required a third term? Although he did not get a third chance, he nonetheless foisted some of his boys on the country. In the Punch newspaper of Saturday, Novemebr 22, 2014, he admitted checking medical papers of his successor, Musa Yar 'Dua, who later fell ill and died in office, before the current President Goodluck Jonathan, then a Vice President, became president. All theses means he hand picked his successors and the election was merely a formality. Does Onasanjo think he has made a mistake of foisting Yar 'Dua and Jonathan on Nigeria and feels he has to correct another mistake by his overt criticisms of the present ministration and encouraging defections of members loyal to him to the opposition as a way to effect a change of leadership to do what he could not do while in office? Evidently, Obasanjo has become one of the richest and most powerful political players. He surrounds himself with all forms of political characters he uses and dumps s he pleases. Apparent every Nigerian has a right to participate in the country's politics and to criticize the government, Obasanjo may not be faulted for his criticisms of the present government. But when such criticisms become overt and pointing to deliberate acts to discredit and replace a government careless of what happens to the country, it becomes salient for curious observers to ask the former president about what he wants again, having ruled the county twice and transferred power twice - first from military to civilians and second from civilians to civilians. One should not think the former military officer wants to precipitate a return from civilian to the military leadership, with defections and all the defectors paying him homage in Abeokuta and he approving of their acts. Jonathan may not be the best leader Nigeria has in history. But the burdens he inherited were from years of locust created by leadership style caused by leaders like Obasanjo. Despite Obasanjo's posing to have wisdom that others don't. Moreover, this democracy belongs to all Nigerians, and not only to Obasanjo and his political renegades. It is time for a shift, and the current power holders and the opposition must give way to a change Nigerians desire for politics with a purpose to benefit Nigerians. Rather than lift Nigeria up, the leadership they have offered all these years is forcing Nigeria down the path of abyss, as we have all been witnessing from1979. Obasanjo has lost whatever opportunity he seeks to right the wrong in the Nigerian scheme of affairs, and may never regain it again. He had the opportunity twice and blew them.